Roofing Grants Pass | Rogue Valley Roofing Contractors in Grants Pass OR. Residents of Grants Pass sleep under your home’s roof every night, and trust that it will remain safe and intact for years. Then off to work you go and again under the protected shelter of the always can count of roof.This will indeed be the case if it was constructed and installed properly, but right now, it may be in need of possible maintenace, a need for re roofing or it just may be the time for a new roof altogether. Whether its a water leak or other visible signs of wear and they are not attended too it can quickly be become downright dangerous. We know how disastrous a roofing cave-in can be, and have unfortunately seen this happen too many times. All it takes is a bad Grants Pass storm or falling debris from a nearby tree to send a faulty roof into shambles. If a roofing issue strikes, standard upkeep or an emergency need, Robert Rivero and his licensed, bonded and insured roofing team are just one call away. An Expert Grants Pass Roofing team that can handle any service need. A full range of residential and commercial roofing services. A small, locally owned company with large capabilities. 20+ years of industry experience by a family operated business. This is just a small part of what you should expect to receive when hiring Rogue Valley for your roofing needs. Having had the pleasure of working in the field for two decades, in which time our brand has witnessed sheer success throughout not only Grants Pass but also the entire central/northwest Oregon region; our crew of roofing professionals is committed to serving every customer with the utmost quality and respect! You know it needs to be right. Stop the headaches. 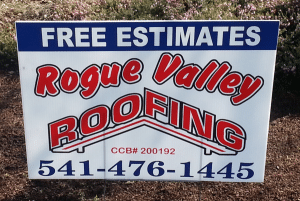 Call Rogue Valley Roofing now! Anybody with a hammer, bucket of nails, and stack of shingles can call themselves a roofer, but not for a second does that mean the job is going to be performed properly. There is simply too much at stake and risk to hire anyone less than a licensed, bonded, and certified contractor. Fortunately, Rogue Valley possesses all of this and more. Over the course of the last two decades, we have garnered a solid reputation for unwavering customer satisfaction. Striving for excellence is nothing new to our crew, which is illustrated via our unparalleled product warranties (the best in Oregon), community-focused professional interests, and diversified service base. Make the smart choice, keep your your Grants pass residential and Commercial roof in good and high quality shape. If the need arises for service contact Rogue Valley today for a free, no obligations quote!